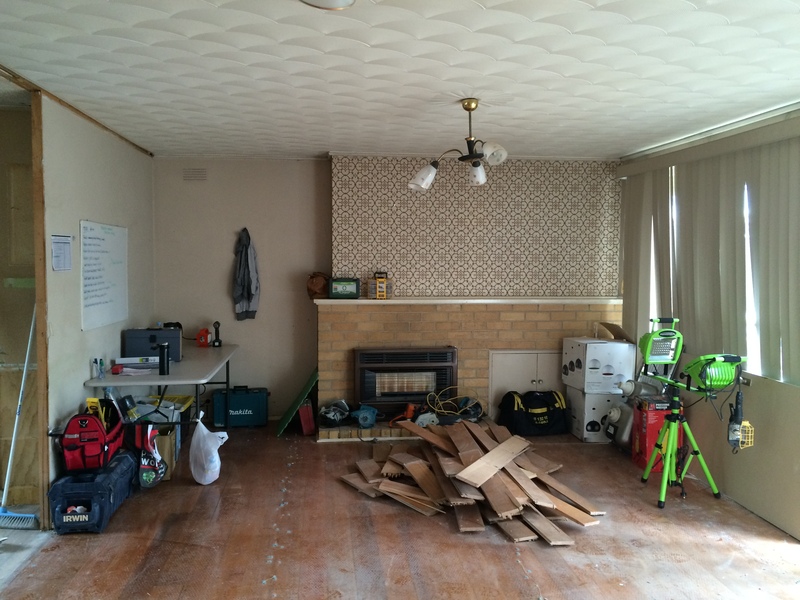 If you’ve been reading along with the Follow My Reno series, you’ll know that I’ve taken on the mammoth task of managing the renovations of an investment property in Frankston. On April Fool’s day – of all days – my husband and I, plus another couple, purchased a real fixer-upperer investment property, which you can read about here. So why did I choose DIY Project Management over paying a licensed professional to do it for me? Because managing your own renovation is exciting, gratifying, and despite the fact that my stress levels are out of this universe, it can actually be fun. But as with most things on this blog, it’s not without a few core lessons. Lessons I want to share with other women who are taking on DIY project management, home renovations, or purchasing their first investment property. Once you’ve set the scope of the project, hired a renovations team and decided on your budget, it’s time to get your worksite organised. This spot operates as the nucleus of the worksite. It’s a space of order, and where all the planning is done. You know how it’s best to set up a study in a certain room of your house, so you don’t get distracted by Dora the Explorer on the TV when doing your tax? It’s exactly the same thing. When you designate an area reserved for organising tasks and meeting with your team, you’ll be far more efficient with less distractions. This is the thinking space. The rest of the house is the doing space. Learn to distinguish between the two. It’s that thing where the time lost switching between tasks, dealing with flat batteries, searching for the right drill bit or where the hell you left the stanley knife is just plain frustrating not to mention a waste of time. In action: Choose a room in your house to become the project management area. Things to put in this area include: white board, markers, pens, paper, key phone numbers, spare keys, first aid kit, safety equipment, and cleaning equipment. DIY Project Management: doozy or must-do? Cords are a huge safety issue. Eliminate risk with a designated are for charging tools, phones, and also for basic things like boiling the kettle for tea and coffee. You’ll also need a residual current device like this one from Bunnings . This is a safety switch which will protect you and your team from potential electric shock. They work by immediately switching off the supply of electricity. If there’s one thing that I’m passionate about doing, it’s smashing gender stereotypes. But for some reason, I’ve found that men have never quite learned to keep the toilet clean. Remember: this is your house. Set up the toilet with stacks of dunny paper, and make sure the sink is in working order with plenty of hand soap. DIY Project Management: doozy or must-do? Let me know what you think, or if you’ve managed your own home reno before.